Dear customer, please note that our meal deals are already discounted which is why the prices differ from our printed menu and our online prices. We thank you for your understanding. 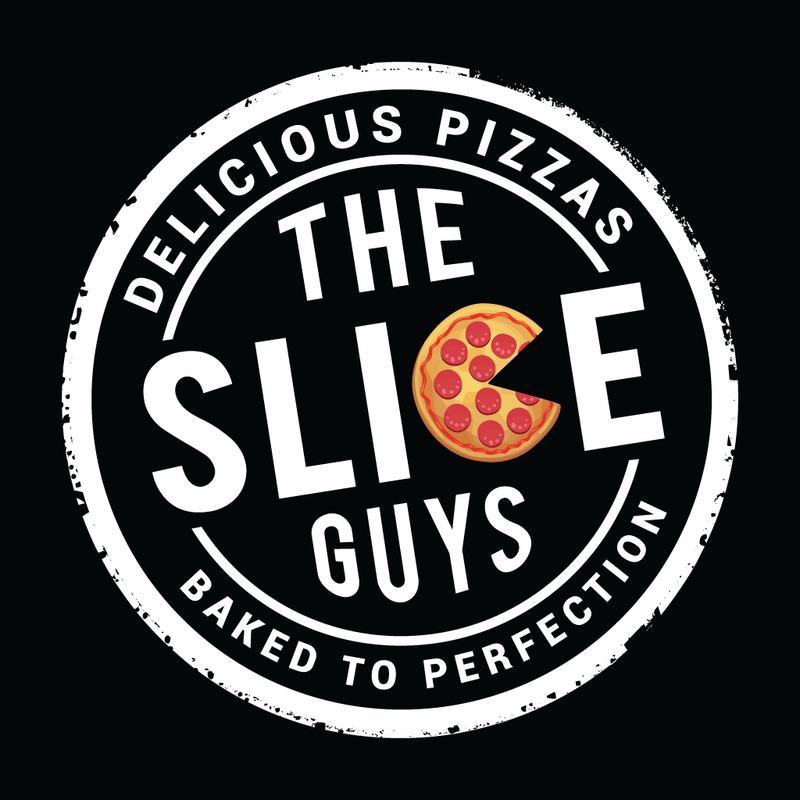 The Slice Guys management. 10" margherita, small donner kebab, chips, 2 x dips & 2 cans of soft drink. 2 x 10" pizzas with 3 toppings on each, chips, portion of donner meat, 2 x dips & a can of soft drink. 2 x 12" pizzas with 3 toppings on each, chips, portion of donner meat, 2 x dips & a 1.5L bottle of soft drink. 2 x 12" pizzas with 3 toppings on each, small chicken parmesan, 2 x chips, portion of donner meat, 2 x dips & a 1.5L bottle of soft drink. With a choice of pizza sauce base, tomato base, chilli tomato base or bbq base. For extra toppings and stuffed crust simply "select extras" in your cart at the online checkout. Mushrooms, peppers & red onions. Mushrooms, peppers, sweetcorn, onions & pineapple. Peppers, red onions, jalapenos & chilli flakes. Peppers, sweetcorn, red onions, green chillies & chilli flakes. BBQ base, chicken & onions. Meatballs, red onions & peppers. Ham, sausage, onions & garlic butter. Tandoori chicken, onions, peppers & chilli flakes. Pepperoni, onions, peppers, jalapenos & chilli flakes. Pepperoni, salami, spicy beef & garlic butter. Spicy beef, mushrooms, red onions, jalapenos & garlic butter. Pepperoni, onions, jalapenos, chilli flakes & garlic butter. Pepperoni, salami, peppers, chilli flakes & garlic butter. Tandoori chicken, pepperoni, red onions, chilli flakes & garlic butter. With a choice of pizza sauce base, tomato base, chilli tomato base or bbq base. For extra toppings and stuffed crust base simply "select extras" in your cart at the online checkout. Tuna, onions & garlic butter. Tuna, cockles, prawns, onions & garlic butter. Bolognese base, onions, peppers & chilli flakes. BBQ base, spicy chicken, pepperoni, onions & chilli flakes. Spicy chicken, diced pepperoni, red onions, green chillies, chilli flakes & garlic butter. Chicken curry, spicy beef, peppers, onions, jalapenos & garlic butter. Salami, meatballs, sausage & spicy beef. Double spicy beef, red onions, peppers & sweetcorn. Pepperoni with half donner & half chips. Pepperoni, ham, chicken, meatballs, onions & garlic butter. Jalapenos, chicken tikka kebab, onions, chilli flakes & garlic butter. Spicy chicken, diced pepperoni, red onions, green chilli, chilli flakes & garlic butter. Pepperoni, half donner & half chips. Half donner & half chips with sauce. Cheese, half donner & half chips with sauce. Topped with kebab meat, chicken kebab, shish kebab, chips, salad & garlic or chilli dip. 100% chicken escalope deep fried in breadcrumbs, covered in bechamel sauce & melted cheddar cheese, served with chips, salad & dip. To change your chips to potato wedges or add extra sauce simply click "Select Extras" in your cart at the online checkout. Pepperoni, onions, green chillies, chilli flakes & garlic butter. Bolognese, onions, peppers & chilli flakes. Served with salad. Meal comes with fries & can of soft drink. Served with chips & salad. Dear customers. Please note that our meal deals are already discounted which is why the prices differ from our printed menu and our online prices. We thank you for your understanding. The Slice Guys management. Double chicken, hash brown, onion rings, grilled onions with mayonnaise. Double beef, hash brown, grilled mushrooms, onions, melted cheddar cheese & mayonnaise. Double beef, melted cheddar cheese, pepperoni, jalapenos, grilled onions with spicy mayonnaise. Double beef, grilled peppers, onions, cheese, jalapenos & melted cheddar cheese with spicy mayonnaise. Double beef, donner meat, melted cheddar cheese with garlic & chilli sauce. Double beef, regular chicken, hash browns, melted cheddar cheese with mayonnaise. Double cheese burger with deep fried crispy jalapeño cheese bites. Served with garlic or chilli sauce. Served with chips, salad & sauce on the top. Plain chicken in lemon & herbs. Spicy chicken marinated in a special tandoori sauce. Donner meat, chicken or spicy chicken. Donner meat, kofte kebab with plain or spicy chicken. Served with chips, salad & garlic or chilli sauce. To add cheese for extra £0.60p simply click 'Select Extras' in your cart. Chicken marinated in special tikka sauce. Parmo wrap filled with donner kebab meat. Pieces of hotshot chicken parmesan. Donner meat with plain or spicy chicken. Served with a Buddies kids drink. All other cans of pop can be added for an extra £0.30p. Simply click 'Select Extras' in your cart. Best takeaway I've had in a long time. Chips were amazing. Both burgers we orders were cooked to perfection. Will definitely be using again. Always lovely and very tasty! The delivery was bang on time and the delivery driver was really polite and chatty not like some miserable other places where they just ask for your money and run ! always nice to receive 10% off when you order online too ! Lovely pizza really well made and the chips were hot with a very nice chilli sauce on top. Quick delivery as well. Fantastic food and service once again! Until next week ð???ð??? First meal from here and it was excellent the pizza was cooked just right and the cheesy chips were very tasty. Ready for when it said it would be and great food. Defo recommend the burgers. Every time we order the food is amazing! Went for the California Burger this time and it was unnnnreal!! First time using these. Arrived early, nice and hot. Got the Parmesan, it was huge and very very tasty.